Meatballs are a low carb staple! These tasty meatballs are in a delicious sauce! Try them over some mashed cauliflower! In a medium bowl, combine ingredients for meatballs, mix with your hands thoroughly. 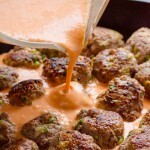 Make 28 meatballs by spooning heaping 1 tbsp of mixture and rolling between your hands. Lay on a cutting board or plate. Set aside. In a small bowl, whisk together sauce ingredients and set aside. Preheat large, 12" or larger, skillet on high, spray with cooking spray. Add meatballs and cook until brown, for about 2-3 minutes. No need to cook the meatballs through. Add the sauce, reduce heat to medium and simmer for 15 minutes, uncovered. Add garnish like fresh cilantro and green onions. Storage Instructions: Refrigerate covered for up to 3 days. Freeze in an airtight container for up to 3 months.